Red Weigela --- Belonging to the weigelia family this variety is a hardy shrub with beautiful red flowers reaching a mature height of 6 feet. A hardy, deciduous shrub that develops into a mound about 6 feet in width. 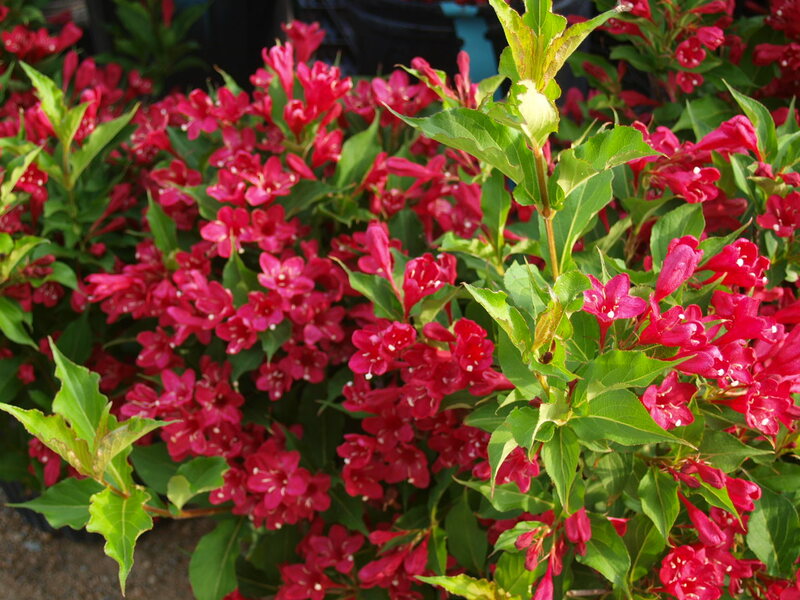 Plant red weigelia in full to part sun and supply a well drained moist soil for the best results, while providing the ever-increasing roots plenty of room to spread. The full red blossoms will attract hummingbirds to your garden, blooming both early summer as well as later in the season. Red Weigelia makes a perfect specimen to plant alone or in groups for a natural hedge, adding privacy to any landscape. Mature Plant Height-- From 4 to 6 feet at full maturity. Mature Plant Width-- From 4 to 6 feet wide at full maturity. Sunlight-- Full to partial sunlight. Growth Rate-- Moderate to fast growth. Soil conditions-- Well drained moist soil. Dynamite Crepe Myrtle - The Dynamite Crepe Myrtle knew as The Dynamite Crape Myrtle does not only have one the most vibrant red flower blooms, but this plant has this beauty for months at a time. This lovely plant is resistant to most all pests and even diseases. But one the best perks about The Dynamite Crepe Myrtle is how very little plant maintenance it will require, while also boosting your properties value. These trees take their time getting started, but once they start producing their massive blooms, you will fall in love with their beauty. These plants can grow up to a last 30 foot, yet require very little space. This plant has been called The Stop Sign Red; its beauty will stop people right in their tracks. Plant Mature Height: 20 - 30 ft.
Plant Mature Width: 10 - 20 ft. The Tea Tree is commonly found along stream banks or in swampy areas in Australia. It has a beautiful papery bark along with white blooms in June. In the autumn, small, woody, cup-shaped fruits will appear on the tree. Tea Tree oil is probably the most famous by-product of this tree. The oil is made by steam distilling the leaves and combining the condensation with an oil base (generally olive oil). The result is an antibacterial and anti-fungal for external use only. As a container plant, the Tea Tree is perfect for a high ceiling home. Placed in a large container with open, functioning drainage holes in bright light, the tree should live for many years. Fertilize monthly with a liquid fertilizer. Rhododendron shrubs burst into brilliant bloom in the spring. The color of the flowers ranges from white to pink or deep violet. Rhododendrons grow to heights of five to six feet. Some species grow as high as 20 feet. This deciduous plant prefers dappled sunlight and well-drained soil. The soil should be slightly acidic. Prune the rhododendron just after the bloom fades. Break the stem where the old flower is attached. Do not disturb the flower bud clusters located at the base or flower production will be reduced the following season. Use light pruning to shape the shrub and to maintain size. This shrub grows dense and somewhat large. Use careful planning when planting beside a house or other building. Snowball Bush - The Snowball bush is a unique plant.  Its height and width are perfect for all shrub lines. The Snowball Bush has the prettiest little round flower groups all over it, giving it the look and appearance of being covered in snowballs. On an average, the Snowball plants can be bought in root balls. Remember to plant the root ball for each plant twice as thick, twice as wide as the root balls. Remember to keep this plant at its happiest and healthiest that it thrives the best when watered twice weekly. Just enough water to prevent soil from getting too dry, given the fact these plants thrive in full sun. When planting remembers to leave plenty of room for future growth. These plants on an average get 10 - 12 ft around. The Snowball plant is not only gorgeous alone, but many smaller flowers planted around can also make this bush stand out even more beautifully. This plant is also well known for being a beautiful bird attraction because during the fall times the forest will have small berries on it. Mature Plant Height: 10 - 12 ft. Mature Plant Width: 10 - 12 ft.
Plant Spacing: 4 - 5 ft.